A new national security concept will be developed in Belarus in 2010. The matter was discussed as State Secretary of the Security Council Leonid Maltsev delivered his report to President of Belarus Alexander Lukashenko on 24 December, the press service of the head of state told BelTA. The meeting tabled ways to improve Belarus’ national security system and its criteria. The existing national security system has proved its viability: the economic, political, and social situation in the country is stable. But new challenges and threats that emerge across the globe require a better national security system. This is why a new concept of the national security will be put together in H1 2010. It will be a methodological guideline for the operation of all government agencies. Alexander Lukashenko stressed that efforts meant to improve the national security system should penetrate the entire country starting with common citizens, who should see their role and place in the system, and ending with government agencies. The new system will take into account all the changes that have taken place in Belarus, in the region around it and the world on the whole. The improved national security system should respond to possible threats and challenges in an adequate and forestalling manner. President of Belarus Alexander Lukashenko sent birthday greetings to President of the Republic of Azerbaijan Ilham Aliyev, BelTA learnt from the presidential press service. Alexander Lukashenko noted that the Belarusian-Azerbaijani partnership is reaching a new level. The progress is based on political stability and high economic potential of both countries, and friendly relations between Belarusian and Azerbaijani people. “I am confident that the relations between Belarus and Azerbaijan will keep dynamically developing for the benefit of the two nations,” summarized the President of Belarus. President of Belarus Alexander Lukashenko congratulated Emperor of Japan Akihito and the Japanese people on the national holiday – Emperor’s Birthday, BelTA learnt from the presidential press service. Alexander Lukashenko expressed confidence that the multifaceted cooperation between Belarus and Japan will develop dynamically due to the concerted effort of the two countries. Representatives of seven CIS states plan to sign a document in Minsk on 24 December to unify the measurements used in the armed forces. Representatives of defense and diplomatic agencies of Armenia, Belarus, Kazakhstan, Kyrgyzstan, Russia, Tajikistan and Uzbekistan convened in Minsk on 23 December. They are busy discussing ways to ensure the uniformity of measurements their armies use, BelTA has learned. After the meeting the sides are supposed to sign a protocol on amending the agreement on cooperation in ensuring the uniformity of measurements in the armed forces of the states parties to the agreement on pursuing an agreed policy on standardization, metrology, and certification. According to Andrei Sidorenko, a department head at the Secretariat of the CIS Defense Ministers Council, the changes are necessitated by changes in laws of the said CIS member-states. In addition, the countries have adopted a program for joint metrological support for the armed forces in 2002-2010. The program also contributes to making the corrections in the area of measurements necessary. Russia is not going to support opposition political movements in Belarus, Ambassador Extraordinary and Plenipotentiary of Russia to Belarus Alexander Surikov told a press conference on 23 December. Alexander Surikov said that official bodies of Russia were not preparing a meeting between Russia President Dmitry Medvedev and opposition politicians. “In my opinion, in Belarus there are no leading opposition politicians as such. A leading politician is someone backed up by a great number of people. The Belarusian opposition is in a split. This is why we acknowledge Alexander Lukashenko as Belarus’ leading politician. It is the politician that we will meet with and will build our relations with,” said Alexander Surikov. Speaking about Russia’s possible support for informal non-state movements that speak in favor of tighter Belarusian-Russian ties, the Ambassador stressed that the support can be granted only to those who do not oppose the existing Belarusian authorities. In order to make the decision to support this or that Belarusian movement, the Russian side should separate the right from the wrong in order to ascertain the readiness of a power to dialogue with the nation’s elected government, added the diplomat. He stressed that Russia is in favor of improving Belarus’ dialogue with Europe, including the dialogue within the framework of the Eastern Partnership Initiative. “Russia’s support played its part in opening Belarus to Europe. We will continue supporting it, provided there are no anti-Russia intentions,” said the Ambassador. Alexander Surikov said he was confident that the next year the sides will come to terms regarding expanding the presence of Belarusian TV channels in the Russian media space. “Parity should be sought in this area. Russian viewers will benefit from it, too,” he said. Russia has never pressed Belarus to recognize Abkhazia, S.Ossetia, Ambassador Extraordinary and Plenipotentiary of the Russian Federation in the Republic of Belarus Alexander Surikov told a press conference. “We have laid down neither direct nor indirect demands. Russia is well aware that this matter is in the purview of the sovereign Belarusian state,” the Ambassador stressed. The Russian side sees that this issue is being considered by the Belarusian parliament, bur “is not going to pedal this process,” Alexander Surikov said. “The country should act solely in its own interests,” the diplomat said. A state register of information systems has been created in Belarus, BelTA learned from representatives of the Information Technologies and Communications Ministry. The state register includes four systems: the nationwide computerized information system, the computerized land appraisal information system, the computerized system for keeping the single register of administrative-territorial, territorial units of the Republic of Belarus, the computerized border control system Berkut-B. The creation of the register is envisaged by the law “Information, informational support, and information security”. The state registered is operated by the Applied Software Systems Institute of the Information Technologies and Communications Ministry. The state registration of information systems is supposed to enable citizens and corporations, state agencies, local executive bodies to access information about existing state information systems and to coordinate the creation and operation of national and regional information systems. The state register is part of the digital government infrastructure, which is supposed to facilitate and accelerate the provision of electronic services of the state to the general public up to making them real time, said the source. The Ukrainian state corporation Ukrtransstroi is interested in investment transport infrastructure projects in Belarus, BelTA learnt from Pavel Bozhanov, chief of the department for the development of transport systems, logistics and investments of the Ministry of Transport and Communications. The terms of cooperation between organizations of the Transport Ministry and the Ukrainian corporation were discussed recently in Minsk. “The Ukrainian specialists expressed readiness to cooperate with the companies affiliated with the ministry in implementing investment transport infrastructure projects in Belarus. They offered us their services in engineering and financing and also offered Belarusian subcontractors to take part in joint projects,” said Pavel Bozhanov. On its part, the Transport Ministry presented the biggest projects to be implemented in Belarus in the next few years. These are the repair of the second airstrip in the Minsk national airport, modernization of M-5/E271 motorway Zhlobin-Gomel, electrification of the Osipovichi-Zhlobin-Gomel and Zhlobin-Kalinkovichi railways. In the near future the representatives of the Ukrainian corporation are set to study the documents submitted by the Belarusian side to choose the project they would like to take part in, and determine the avenues of future cooperation with the Transport Ministry of Belarus. Ukrtransstroi is on of the major construction corporations in Ukraine. Its companies provide the full range of services in transport construction and complex designing and reconstruction of roads and railways, bridges, airports, river and sea ports, landing piers and other waterworks. The corporation has constructed railways in Ukraine, Guinea, Iran, Iraq, and Syria. In January-October 2009 Belarus increased the export of the oil products up to 12.7 million tonnes that is 1.2% up as against the same period 2008, BelTA learnt from the National Statistics Committee. Belarus’ export of nitrogen fertilizers skyrocketed by 81.6% and totaled 218, 900 tonnes in January-October 2009. During the same period Belarus exported 3,257 million tyres (3.5% up), and75,100 tonnes of ethylene polymers (3.2% up). In January-October 2009, Belarus’ export of chemical fibers and threads amounted to 127,200 tonnes (down 2.2%), and the export of iron - 1.592 million tonnes (down 0.6%). In January-October 2009 Belarus’ export of meat and meat products boosted to 120,900 tonnes (40.9% up as against the same period 2008); the export of milk and dairy products – to 444,700 tonnes (28% up). The export of many other products is being restored to the pre-crisis level. In January-October the export of potash fertilizers made up 1.44 million tonnes, or 41.2% as against the same period last year. In January it was 14.9% as compared with January 2009. In January-October Belarus exported 31,100 tractors, which accounts for 62% of the sales in the same period last year, 2,107 trucks (19.4%), 855 truck tractors (12.4%). In January 2009 the rate of export growth of these goods made up 40.5%, 16.2% and 7.9% respectively. 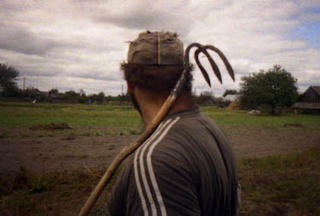 Belarus has made good progress in restoring the deliveries of farm equipment. In January-October the country sold 21,700 vehicles, or 77.4% as against the same period last year (28.1% in January 209). In January-October this year the export totaled 68.9% from the same period last year (27.7% in January), fiber boards 57.6% (35.6%). The export of refrigerators increased from 54.7% in January 2009 to 83.8% in January-October, that of ceramic tiles from 37.1% to 79.8%. Foreign trade in goods in January- October amounted to $39.635 billion, or 62.8% from the same period last year. Export was down to $16,952 billion (58.3% over January-October), import – to $22.683 billion (66.7%). The deficit made up $5.732 billion. Can President Alexandre Lukashenko transform Belarus into a high-tech economy? Alexander Lukashenko has often been referred to as Europe's last dictator. All of a sudden, though, he seems to be on a push to rapidly liberalize Belarus' economy and turn it into a high-tech paradise. But is this socialist island really ready to attract Western investors? Belarusian President Alexander Lukashenko suddenly seems like a different man from the one his country has always known. The authoritarian leader -- who still presides over celebrations every November 7, the anniversary of the Bolsheviks' October Revolution -- is now behaving more like a member of the opposition. In his public appearances, he rants against "official arbitrariness," calls for "economic liberalization" and declares that the former Soviet republic must become "attractive to investors." This is Minsk's autocrat speaking, the man who likes the country's children to call him "batko" ("father") and whom many consider to be Europe's last dictator. 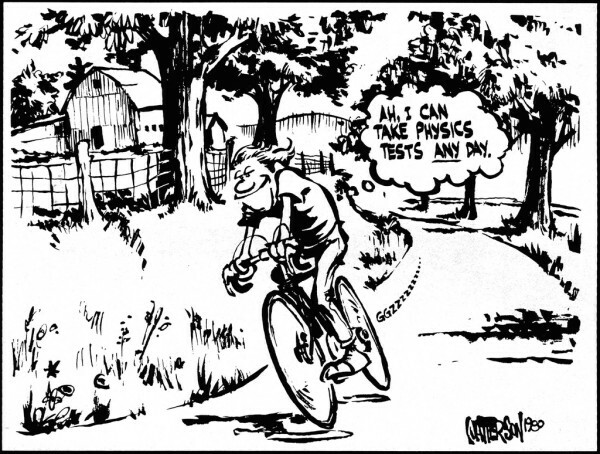 Has he suddenly mutated into a reformer? Well, you can say for sure that there has been some progress. Belarus now ranks among the top-ten reformer countries on the World Bank's "Doing Business" index in the business-formation category. Likewise, Germany's Committee on Eastern European Economic Relations, a joint organization of leading associations representing German businesses, has noted Belarus' "investment climate improvement" and that there are 360 German companies active in the country. Until recently, the republic kept itself almost as isolated as it did in its Soviet days. Now it invites investors to Minsk, its capital, for international conferences. The country has considerably increased its income by selling off state-owned enterprises -- such as the domestic cell phone carriers Velcom and Best -- to foreign investors. In 2006, such sales brought $30 million (€21 million) into the country's coffers; a year later, this figure had jumped to $1.2 billion. The International Monetary Fund has praised Lukashenko's financial policies as well as the fact that he wants to stabilize the country's currency, which has already suffered 20 percent in devaluation. The president "reacted well in the crisis," says Herbert Stepic, CEO of Raiffeisen International, which operates the fifth-largest bank in Belarus. All of this leaves Europe wondering: What has come over Lukashenko? Is Belarus poised to become the next tiger economy? For years, Valery Tsepkalo has worked with the Lukashenko on changing the country's course. A former ambassador to the United States, Tsepkalo is director of the Belarusian Hi-Tech Park and an official "aide" to the president. Sitting on a white leather sofa flanked by an artificial waterfall on the eighth floor of a modern building on the edge of Minsk, Tsepkalo is reinventing his country. As he imagines it, Belarus should become "an information technology leader in the Eastern European and Baltic region." He believes that a "Belarusian Silicon Valley" is emerging. There are 72 software development companies registered at Minsk's Hi-Tech Park. They enjoy benefits when it comes to the taxes and duties they have to pay, and they can rent office space for a monthly fee of just $3 per square meter (11 square feet). For example, one business that has taken up quarters here is Epam Systems. Founded in the US, the company has 2,000 employees in Belarus, many of whom are hardly older than their mid-twenties; its clients include Bosch and SAP. The average monthly salary in the Hi-Tech Park is about €1,000, or roughly four times that of the country as a whole. Still, probably even Lukashenko himself doesn't believe the entire country can really transform itself into a high-tech paradise. In fact, Europe's last bastion of socialism is in danger of running out of steam. Even if the IMF is predicting that Belarus will enjoy economic growth once again in 2010, Lukashenko still needs money. And he's welcoming help from wherever he can get it. He received $2 billion in loan commitments from the Kremlin, and the IMF paid out almost $700 million in late October as part of a $3.63 billion loan. More than anything, Lukashenko is looking for Western investors. He plans to sell 52 percent of the shares in the long-established Luch watch factory in Minsk to Swiss watchmaker Franck Muller, whom the president praises as an investor that embodies "humane" privatization. Lukashenko clearly doesn't have the same confidence in the Russian oligarchs who are also interested in investing. He rebuffed the Russian state-run Sberbank the first time around when it wanted to take over Promstroibank, a large Minsk-based financial institution. Lukashenko complained that the Russians were only offering half as much as he was hoping to get. Then Russia ratcheted up the pressure, and Lukashenko eventually agreed to the $280 million deal -- in order to continue receiving natural gas at a discount until 2014. Still, Lukashenko made his deep mistrust for Moscow known within a select circle of sympathetic Russian listeners. With Russian investors, the autocrat asks, who can guarantee they won't buy something and then drive it into bankruptcy? That's exactly what happened when shady investors from Moscow acquired the Wadan shipyards in Rostock, on Germany's Baltic Sea coast. In reality, the president's goal isn't reform; instead, it's control over the country's most important companies. Lukashenko recently made snide remarks about "all this privitization mess" to people close to him, and he reiterated his support for "state regulation of the economy," including "state intervention in setting price policies." The government originally announced that it would sell 519 state-owned enterprises. But now, experts such as Ricardo Giucci and Robert Kirchner from the German Economic Team in Belarus, a consulting group financed by the German government, describe a "standstill in the privatization process" that is "questionable in terms of economic policy." Moreover, Lukashenko is currently submitting offers for five pilot companies that are to be privatized in accordance with an IMF requirement, but all have turned out to be rather unattractive. The president's offerings include a bottling facility for sparkling wine, an obsolete ball bearing factory and a Soviet-era hotel in the provincial city of Brest. Unsurprisingly, private investors remain the exception to the rule, and the government controls around three-quarters of Belarus' economy. Still, one successful privatization has taken the form of the joint venture between Minsk's truck manufacturer and the German automotive company MAN. Around 300 workers assemble 45 heavy trucks and excavators per month in the company's orderly factory rooms. Deputy director Stanislav Ivanyushenko regularly sends employees to Germany for additional training. But, just a few kilometers away, in the "Minsk Tractor Works V. I. Lenin," socialism never seems to have died out. The factory, whose sales have reportedly fallen by more than a third, is cutting costs even when it comes to heating the workrooms. In an assembly hall that is nearly one kilometer (0.6 miles) long, workers on the production line attach engine blocks to red-painted tractor chassis at temperatures just a few degrees above freezing. Although the tractors are meant for export, at first, they generally end up spending a long time in stockpiles. Deputy director Igor Yemelyanovich still acts the part of the successful manager. "We're doing great business and don't need to privatize," he maintains. Still, the state-owned company, with its 36,000 employees, is not slated for sale. Likewise, government investigators have cast a pall over the company's possibly cooked books. The State Control Committee has initiated two criminal proceedings against managers at the tractor factory for abuse of authority and currency profiteering. The investigators found evidence of bogus transactions as well as sales to Russia at predatory low prices. Even the governmental newspaper Soviet Belarus has admitted that the company is operating "on the brink of standstill." Such reports may force Lukashenko to open his country to the West considerably sooner than he had planned to. That's precisely what the European Union is hoping for and, in anticipation, it has even lifted a ban prohibiting members of the Belarusian government from entering EU countries, which was imposed in 2006 as a result of suspected electoral fraud. In early December, Italian Prime Minister Silvio Berlusconi gave the country's status a boost when he visited Minsk. The trip marked the first time that the head of an EU country had visited Lukashenko in 15 years. Right away, Berlusconi shamelessly overdid things a bit in his pleasant remarks, gushing: "I thank you and your people, who love you, as can also be seen from the elections." Belarus and Venezuela have agreed to invest $8 billion in joint development and production at the Junin-1 oil deposit in the Orinoco River Basin, the Venezuelan oil and energy minister said. The agreement, which also envisions the construction of a heavy oil refinery in the region, was reached during a meeting of a high-level intergovernmental commission on Wednesday in Caracas. Rafael Ramirez said the Junin 1 deposit contains an estimated 2 billion barrels of oil and could produce up to 200,000 barrels per day. Venezuela is one of the largest oil producing countries in the world, with about 87 billion barrels of proven conventional oil reserves as of 2008. In addition, it has massive non-conventional oil deposits (heavy crude). Most of these deposits are located in the Orinoco oil belt. Belarus, which has no hydrocarbon resources of its own, heavily depends on energy supplies from Russia and is seeking to diversify energy imports. State-run Belarusian oil producer, Belorusneft, which opened a representative office in Venezuela in 2007, has already established a joint venture, Petrolera BeloVenezolana, jointly with Venezuela's state-owned petroleum company PdVSA for oil exploration and production. During January-November of 2009, all varieties of agricultural economies in Belarus increased output of agricultural products by 1% compared to the same period of the previous year, to the sum of 25.5 trn. BYR (8.92 bln USD), declared the National statistics committee (Belstat). According to the forecast, in 2009, the volumes of the general agricultural products output in Belarus will grow by 8.5-9.5%. According to data of Belstat, during January-November of 2009, the production volumes of agricultural organizations and farming economies grew by 3.8% compared to the same period of 2008. At the same time, economies of the population decreased the output by 4.2%. Belarus needs to speed up liberalisation and privatisation of its economy if it hopes to reach the ambitious 11-13 percent growth pace forecast for next year, the country's new economy minister said on Tuesday. Nikolai Snopkov, appointed in an early December government reshuffle, said the largely state-run economy needs to reform quickly. "It is necessary to attract capital from the world's largest brands and international corporations," local agencies quoted Snopkov as saying at a government meeting. "The privatisation process did not accelerate in 2009." Belarussian President Alexander Lukashenko sacked the previous economy minister along with trade and tax ministers on Dec. 4 in an attempt to end the economic stagnation that took hold in the ex-Soviet republic in the second half of this year, after years of robust growth. Official figures showed the Belarus economy still growing in the first half of this year despite the steep global downturn. The economy in Belarus is still run along Soviet lines and economists said the government had pressed companies to keep producing goods they could not sell as demand and prices for their machinery, agricultural and chemical products plummeted in their main markets, Russia and Europe. Gross domestic product contracted 0.4 percent in January-November, with officials hoping for stagnation at best at the year's end. The government has turned to international financial organisations for aid. On Dec. 19, the International Monetary Fund disbursed a fourth tranche of a $3.63 billion stabilisation loan, urging the government to continue with structural reforms and prudent policies. Snopkov said that following the liberalisation of most retail prices Belarus introduced at the end of October, the government should also abandon producer price regulation. "The existing system of administrative price control, disregarding certain increases and liberalisation, is a problem for conducting business," Snopkov said. The International Monetary Fund (IMF) expects the Belarussian economy to grow 1.8 percent next year after a 1.2 percent contraction in 2009, and the budget deficit is seen at $1 billion. Belarussian Finance Minister Andrei Kharkovets said on Monday the government's forecast of 11-13 percent growth in gross domestic product terms is "an ambitious programme," but added that the government took a very conservative approach regarding economic growth in planning its 2010 budget . Such a disappointing forecast has been made by the largest unions of businessmen of Belarus. The round table discussion organized by the Republican conference of entrepreneurship and Minsk metropolitan union of entrepreneurs and employers, journalists hadn’t been invited. However, as “Ezhednevnik” was informed by the chairman of MMUEE, Uladzimir Karyahin, 38 persons have taken part in the conference. Among them were members of business community, independent analysts, and scientists from the Institute of the Economy of the Academy of Sciences and Belarusian universities. Main topics for discussion were drafting the National platform of business -2010 and prospects of work in the next year. Participants of the round table expressed their opinions about necessity to develop private business in the country and contribution of the state to this process. As said by Uladzimir Karyahin, in this year the measures on liberalization of the legislation by the state have yielded results. I particular, 52 items out of 145 contained in the National platform of the business have been implemented. At the same time, this result demonstrates that there are still many things to be changed in regulation of the economic mechanisms of the state. And the government should be more active and practical in this process, as the range of possible actions of the business community is limited. As an example of unacceptable tardiness of officials mentioned by Karyahin was a draft decree No.518 “On some issues of renting and gratuitous use of property”, which is to come into force on January 1. The first session of the working group on providing interpretation of how to use this decree is to take place only today. It means that businessmen in fact have no time to get ready for the new rules of renting relations. As for prospects of work in 2010, as said by U. Karyahin, the prevailing attitude of most businessmen is depression and apathy. Entrepreneurs expect the second wave of the crisis which could be more serious than the first one. However, now the internal resources f many companies are exhausted. It is worsened by decrease of citizens’ purchasing power, difficulties in mutual accounts, expensive bank loans, growing competitiveness. Besides, the first year of the Customs Union begins, and it is to bring much uncertainty. As a result, as said by the MMUEE leader, some businessmen in earnest think of winding down their business in the country and opening it in a different state in order to return in a few years. Simply said, business is hoping for the best, but still is preparing for the worst, as it is more realistic. And if earlier year 2009 was supposed to be the worst for Belarusian businessmen, now chances are the next 2010 is to beat it in terms of negative tendencies. 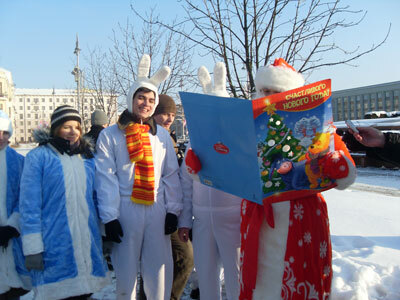 A number of human rights activists wearing the costumes of Snow Maidens and New Year hares have filed a petition with the Belarusian Parliament urging the officials to abolish Article 193-1 of the Criminal Code. The performance was aimed at drawing attention to criminal prosecution for illegal NGO membership after the Parliament members went into recess without even considering the issue, despite numerous statements on possible annulment of the infamous Article. The event was followed by a press-conference outside the Parliament building in Independence square. The performance was held as part of the ‘Stop 193-1!’ campaign, initiated by the Assembly of Belarusian NGOs. 17 persons have been prosecuted and convicted under the Article over the past 4 years. On 23 December Judge Aksana Reliava of Minsk Savetski Court considered the civil cases of two LGBT activists Siarhei Androsenka and Siarhei Pradzed charged with holding an unauthorized picket outside the Iranian embassy on 16 December. Judge Reliava found them guilty and fined the activists BYR 825,000 and 350,000 respectively. Another participant of the picket was fined BYR 105,000 on 17 December. Russia has scrapped January oil exports via Ukrainian ports and also said it fears Ukraine will have problems paying for its gas, a sign of a possible repeat of New Year gas rows which have led to supply cuts in Europe. Europe, which receives 25 percent of gas from Russia, was left short of supplies in January 2006 and 2009 because of pricing rows between Moscow and Kiev. Another key transit state, Belarus, cut Russian oil flows to Europe in January 2007, also due to a pricing row, which further undermined the image of Russia, the world's largest oil and gas producer, as a reliable energy supplier. Analysts have said Moscow is unlikely to be tough on Kiev this year ahead of Ukraine's presidential election in January in the hope Ukraine chooses a relatively pro-Russian leader. Ukraine has been regularly paying its gas bills this year, but the December bill, due before Jan 11, was expected to soar to $1 billion from $770 million in November due to low temperatures. "We assess the situation with payments for Russian natural gas deliveries in December as very alarming," Gazprom's chief executive Alexei Miller told state television. "In the middle of December, there was a trend of a reduction of gas off-take which confirms that Ukraine is facing serious difficulties with (future) gas payments," Miller said. Russia ships 80 percent of its gas transit to Europe via the territory of Ukraine while the rest goes via Belarus. Russian oil transits via Ukraine are less big but are still very important for the Mediterranean markets. Traders said on Friday Russia's pipeline monopoly Transneft told oil firms to scrap oil export plans via Ukraine's Black Sea port of Yuzhny and gave no reason for the move. "All volumes have been taken away. There will be no supplies in January (from Yuzhny)," said one trader, who asked not to be named because he is not allowed to comment on the issue. "It will become clear on Monday what options will be proposed (by Transneft)," said another trader. Oil firms will have to divert some 0.5 million tonnes of crude meant for Yuzhny to other destinations - such as Russia's Black Sea port of Novorossiisk or Primorsk on the Baltic. Affected firms will include Rosneft (ROSN.MM), TNK-BP (TNBPI.RTS) and Tatneft. One cargo was already sold to Morgan Stanley for Jan 8-12 delivery and rerouting it to another port will cause big logistical problems, traders said. Yuzhny remains the last Ukrainian port through which Russia sends transit crude to the West after it stopped exporting crude via another outlet - Odessa - earlier this year. In 2008, Odessa and Yuzhny sent over 15 million tonnes of Russian transit crude - enough to feed a large refinery for a year. Russia and Georgia have agreed to reopen their major border crossing, officials said Thursday, signaling the first thawing of ties between the countries since they went to war last year over a separatist enclave. The crossing, at the Upper Lars checkpoint in the Caucasus mountains, has been closed since 2006, when relations began growing tense, in part because of efforts by the Georgian president, Mikheil Saakashvili, to align himself more closely with the United States. Russia also banned imports of Georgian products, including popular wines, and cut air transportation links. In August 2008, war broke out after Georgia tried to retake South Ossetia, a separatist enclave that has close ties to Moscow, and Russian troops responded by invading Georgia. The countries have not had diplomatic relations since then. The Kremlin insists that it will have no direct contact with Mr. Saakashvili, but it has lately expressed more willingness to lessen the pressure on Georgia. Russia’s president, Dmitri A. Medvedev, said this month that he was not opposed to restoring air links, though he did not formally propose doing so. A Georgian airline said this week that it would apply to the Russian authorities for permission to fly to Moscow from Tbilisi, the Georgian capital. The pass at Upper Lars is the only legal highway crossing between Russia and territory controlled by Georgia, officials said. There are also crossings in South Ossetia and another separatist Georgian enclave, Abkhazia. The Upper Lars crossing links Tbilisi with the Russian city of Vladikavkaz, and reopens the only direct route from Russia to Armenia, Georgia’s neighbor to the south. The agreement to open the border was mediated by Swiss diplomats. While it suggested some progress in relations, other events have underscored the tensions. Georgia demolished a World War II memorial this month in the city of Kutaisi to make way for a Parliament building, causing an outcry in Russia, which called the move sacrilegious. “This is one more attempt to erase the history of the peoples of the former Soviet Union, including the heroic history, from historical memory,” Prime Minister Vladimir V. Putin said Wednesday. He suggested that the monument be rebuilt in Moscow. For Russian officials, the status of such war memorials in other former Soviet republics is a delicate subject. Relations between Russia and Estonia were inflamed in 2007 when the Estonian authorities moved a prominent memorial. The Kutaisi monument also turned into a domestic scandal after a young woman and her 8-year-old daughter were accidentally killed in the demolition blast. Mr. Saakashvili responded by ending his visit to the Copenhagen climate meeting and returning to Georgia, where he dismissed the local governor and ordered an inquiry. Russia will continue developing new nuclear missiles and launchers despite disarmament talks with the US, Russia's President Dmitry Medvedev says. "Of course, we will develop new systems, including delivery platforms, or missiles. This is routine practice, the entire world is doing it," he said. 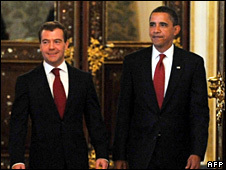 Speaking in a live TV interview, Mr Medvedev said this would not bypass agreements with the US. Russia says it successfully tested a long-range SS-18 missile on Thursday. The missile - called an RS-20 Voyevoda in Russia - was fired from Orenburg in central Russia and hit targets in Kamchatka, in the far east, the Ria Novosti news agency reported. So far Russia and the US have failed to find a successor to the Cold War-era Start 1 treaty. That treaty, which led to deep cuts in nuclear arsenals on both sides, expired on 5 December. Asked why there had been a delay, Mr Medvedev said "this is a difficult question, a very difficult one". "This is a treaty which determines the parameters for developing and reducing the strategic arms potential of two of the biggest nuclear states. We are moving very quickly as it is. We have agreed on almost everything." Both sides have agreed to continue observing Start 1 - which was signed by Mikhail Gorbachev and George Bush Senior in the final days of the Soviet Union - until they reach a new agreement. Under a joint understanding signed in July, deployed nuclear warheads should be cut to below 1,700 on each side within seven years of a new treaty - a huge cut on Soviet-era levels. Nonetheless, between them the two countries will retain enough firepower to destroy the world several times over. “According to prevailing opinion a crisis is the best time for mergers and takeovers. The prices for companies have fallen considerably and the bosses and owners of struggling companies are more inclined to talk to potential investors. At the same time each company thinks five times about making a binding offers and the possibilities for financing huge transactions are heavily restricted by the banks. Ten people have died of cold in Poland over the past day, taking the toll since winter set in earlier this month to 79, police said Tuesday. A national police spokeswoman told AFP that 10 people had been found dead since Monday. The majority of the victims were homeless men who died while drunk, police said. Fifty-two of the 79 deaths recorded since December 1 occurred since Friday, as temperatures plunged to minus 20 degrees Celsius (minus four Fahrenheit). By Tuesday, temperatures had risen to around zero degrees Celsius (32 degrees Fahrenheit). Police and municipal employees have boosted patrols in areas where the homeless gather, notably public parks and allotments, to try to persuade them to head to special hostels. The death toll is far from unusual in Poland, which regularly faces harsh winter conditions. In the 2008 to 2009 winter season, for example, police recorded 82 deaths from hypothermia. Poland's highest winter toll in recent years was in 2005 to 2006, when 233 died. Korean company wants to reduce its biggest investment in Poland – a factory in Kobierzyce near the western city of Wroclaw. LG intended to invest 2.6 billion zloty (620 million euro) in the plant and employ up to 12,000 people but recession thwarted the plans. Instead, the Korean giant will spend 700 million zloty (167 million euro) less on the factory in Kobierzyce and employ 4,000 fewer people than expected. The company has already received a green light for the changes in investments from the Polish government. “Financial crisis resulted in the fall of demand on LG products abroad,” says Iwona Dzygala from Economy Ministry. LG will receive 120 million zloty (29 million euro) of financial help from the government. “However, the company is obliged to keep employment at the present level for five years”, adds Dzygala. Consequently, there will be no redundancies at LG but the company will employ fewer people than planned. Santa will hand out plenty of presents in the early hours of tomorrow, but he will struggle to match the kind of gifts the Celtic defence have been offering this term. With Gary Caldwell seemingly set for pastures new and Stephen McManus and Glenn Loovens both lacking confidence, there is no question Tony Mowbray is searching for a cure for the crippling frailties that could cost his side the title. Simply, you cannot win a league allowing teams like Motherwell – four chances created, two scored – and Hearts – one chance created from open play, two goals scored – to panic a defence the way Celtic’s have been. Spooked by any high ball into the box, there isn’t a team in the Clydesdale Bank Premier League who wouldn’t fancy their chances of breaching their rearguard right now. Under Martin O’Neill, Celtic set an as yet unbeaten record in 2001/02, conceding a mere 18 goals on route to the title – the same number the Parkhead side have shipped so far this campaign. Rangers, Hibernian and Dundee United have conceded fewer and Aberdeen are on a par. The trouble is, accomplished centre-halves with the kind of experience Celtic are looking for do not come cheaply. It is to the back of beyond, then, that Mowbray must search for a commanding defender who ticks the required boxes. Aside from experience, the player must present value for money and offer the possibility of swelling the club’s finances should he move on to bigger and better things. At 23, Dmitry Verkhovtsov seems to fit the bill. Capped 12 times at senior level for Belarus, the player also represented his country at the under-21 European Championships last summer – albeit that he was part of a side who leaked five goals to Sweden during a 5-1 defeat – but big things are expected of him in his native land. But this is the nub of the problem. Celtic are unable to compete with the Barclays Premier League, and possibly even the Championship, clubs when it comes to certain wage demands so it is to uncharted waters that they must cast their net, tapping into potential rather than proven track records. Certainly, those observers in Belarus believe that if he makes the journey to Western Europe that Verkhovtsov can make as big an impact as compatriot Aleksandr Hleb. Igor Kovalevich, who manages the centre-half at club side Naftan Novopolotsk, is essentially resigned to the fact that he will lose the defender when he moves abroad to develop his football education. “After the Belarus national team’s performance in a friendly against Argentina, several European teams came up with the offers about Dmitri,” he said. “We are not afraid to lose him. He must be given a chance to grow into a top-level star. Yet this is not just the persuasive patter of a salesman. Andrei Chepa, a local journalist, also expects the player to make his mark in Britain, where he is suited to the brawnier aspect of the game. “At 6ft 3in he is tall and is a physical defender,” he said. “For the last year many people have expected that Dmitry will move on and it is to Britain that people expect him to go to. He is now widely regarded as not just the best defender in Belarus, but possibly one of the best players in Belarus. It is true that he has to work on the technical side of his game, but what he does very well is defend. “It is the feeling in Belarus that he has outgrown the level here. We would like to see him in the Champions League because he is talented enough to play there. In fact, he could be a better player than Hleb. He still has lots to learn but his development in the last year has been fast and he will keep improving. With the Belarus season finished, there would be no barrier to the player completing a deal next month and arriving in Glasgow to shore up a porous defence. A bit late for a Christmas present maybe, but Celtic and their supporters would certain welcome such a bargain in the January sales. On the night of 24-25 December the Catholics and Protestants all over the world including the Orthodox of Greece, Romania, Bulgaria, Poland, Syria, Lebanon and Egypt will start Christmas celebrations. The Minsk and Mogilev Archbishopric of the Roman Catholic Church will hold Christmas services and meetings. On 24 December, the Minsk Catholic Church of Sts. Simon and Elena will host the Mass and a meeting of Bishop of the Minsk and Mogilev Archbishopric Antonii Demianko with believers. A procession and a solemn meeting will take place near the monument to Adam Mickiewicz. On 26 December, Archbishop Metropolitan Tadeusz Kondrusiewicz will have a meeting with children in the St. John the Baptist Church. In the evening Bishop Antonii Demianko will meet with medical workers and teachers in the Catholic Church of St. Simon and Elena. On 3 January, Archbishop Metropolitan Tadeusz Kondrusiewicz will say the Mass to state officials, businessmen, architects and constructors in the Minsk Catholic Church of St. Mary of Minsk. On Christmas Eve, on 24 December, all the Belarusian Catholic churches and churches all over the world will hold divine services. The Catholic Church of St. Mary will hold the Mass at 7pm (in Polish) and at 9.45pm (in Belarusian). The Mass in Belarusian will broadcast by the First National TV Channel and Belarusian Radio. The divine service will be led by Archbishop Metropolitan Tadeusz Kondrusiewicz of Minsk and Mogilev. On Christmas Day, on 25 December, the mass will take place in the Catholic Church of St. Mary at 8.15am, 11.30am, 1pm and 6.30pm. On Christmas Eve, on 24 December, the Catholic Church of St. Simon and Elena will hold the mass at 8pm (in Belarusian) and at 10pm (in Polish). On Christmas Day, the mass will be held there at 9am, 11am, 1pm, 3pm, 6pm and 7pm. On 24 December at 9.40pm, the First National TV Channel will present an interview with Metropolitan Tadeusz Kondrusiewicz. The First National TV Channel and Belarus-TV satellite will broadcast the Christmas Mass live from the Catholic Church of St. Mary. It will broadcast the Vatican Mass with the participation of Pope Benedict XVI as well. On 25 December, morning, Metropolitan Tadeusz Kondrusiewicz will deliver his Christmas message to the Belarusians on the First National TV Channel. On the same day, the First National TV Channel will also present special programme “Genesis”. On 25 December, the LAD TV Channel will broadcast the Urbi et Orbi Message of His Holiness Pope Benedict XVI to the World. The Belarus-TV satellite channel will broadcast Pope’s Urbi et Orbi Message in the evening as well. Belarus President Alexander Lukashenko congratulated all the Belarusian Christians, who celebrate the Nativity of Christ on 25 December, on the holiday, the press service of the Belarus President told BelTA. The head of state wished everyone to be healthy and successful at every undertaking and to be in high spirits.